How are you leading your business, your community, your staff and your life? Are you leading with your talents and gifts or are you leading with fear and doubt? Today, our unpredictable environment is causing everyone to take stock on themselves and assess how can we do it better and how to give more while doing less. Does this sound like an assessment you are going through? Leadership requires an individual to bring their whole self to the situation – their mind, their body and their Soul. It requires sharing thoughts and actions and using their passion as fuel to move forward. Leadership can be pulling those who don’t see or believe and moving down uncharted waters. This is the history of leadership and the history of business. Since there has been business and corporations there have been assessment tests. These have been created to help both the employer and the employee yet, these don’t take into account the major component for a person — their essence, their spirit, their Soul. Businesses, individuals and organizations of all sizes, have historically utilized different assessment tools to measure their responses. These have been created to help both the employer and the employee yet, these don’t take into account the major component for a person — their essence, their spirit, their Soul. Today’s 24/7 world, is leading us to the blend lines between business and the personal. The result is more than ever before, our essences are leaking into our business lives. Soul Language once reserved for more personal introspection is not recognized as the turnkey to character and leadership development in the workplace. What if there was a way to bring your spirit into your business in a way that would impact the bottom line in powerful way? What if you could have a tangible way to bring your best game and the best parts of yourself to your business, your teams and your life? Would you take the chance in being this new leader? A front runner in your business, your industry and your world? 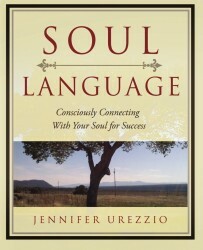 Know Soul’s Language is a way to understand what makes you truly unique. Understanding how your spirit expresses itself, how to let go of those limiting beliefs that are impacting your business and how to bring your A-game is what we are offering. Understand what is Soul Language. How you can start applying it to change your life and your business immediately. Tools to implement immediately to stop fighting with your business and create a more consistent and abundant flow. New ways to step into your leadership ability to invite more community (more clients, more support and harmonious employee relations). Understand at least one limiting belief that is impacting your business and learn how to tap into your gifts and talents to release this block from creating your dream business. If you missed the class and would like the audio please hit the link below and fill out the form below and you will receive the recording! Greatness – Are You Headed For It?